Water blaster accessories are not only designed with safety in mind but also efficiency. Tools below are intended to be used for ultra high pressure (UHP) applications. These ultra high pressure blaster accessories are using European fittings but can be adapted for different connections. Pressure ranges from 7,250 PSI to 40,600 PSI are available depending on the tool you need. When selecting any of these tools, be sure to check pressure threshold and connection requirements. Some common applications for this tooling are like removing graffiti, cleaning buildings, heavy duty vehicles, or roads. 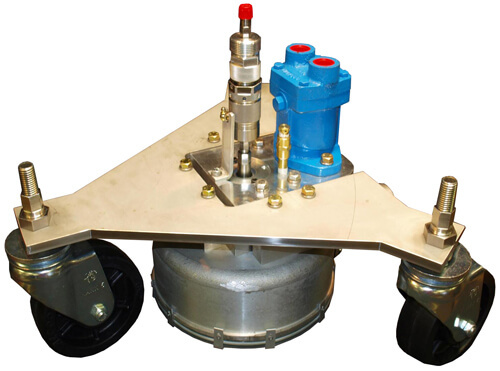 Also, this equipment can be used for roughening of concrete or surface preparation prior to coating. Industries that use Ultra High Pressure are traffic and transport, agriculture just to mention some. Whether cleaning pipes or tanks, stripping trees, or removing marine growth from steel hulls, we have the tool for use with your water blaster. There are a multitude of uses for high pressure equipment. Tools for Surface Cleaning — For cleaning of horizontal surfaces with high pressures. Use in conjunction with a vacuuming system to clean in a non-polluting way. High temperature resistance when using with hot water systems. Made of high tensile stainless steel. Features a large bore swivel. Both units have a high pressure on/off switch and an emergency shutdown button for safety. Wet Sandblast Attachment — Use with pressure washers and water blasters with 7,250 PSI to 14,000 PSI. Designed for ultra high pressure applications such as preparation for surface coatings, graffiti, rust, or paint removal to name a few. Choose your own media locally or choose from our media selections. Sandblast head for permanent use high pressure nozzles arranged in a ring around a central sand feeder. Connector is 9/16” – 18 UNF IG, requires 3 high pressure nozzles E shape, boro-carbide focus nozzle. Specialized tool is for replacing E shape nozzles. 50’ Suction Hose (15M) with steel spiral inlay. Suction pipe is infinitely adjustable for quantity of grit. Quick Removal — For aggressive cleaning action or removal of coatings. Fitted directly to end of lance using 9/16” – 18 UNF IG connector. Machine type 1.1 MM. F shape nozzle. Serviceable with repair kit consisting of replacement ceramic seat and nozzle pin specifically designed for high temperature. Ultimate Weapon for Cleaning — Gun and lance with electric contact via proximity switch, short cable and connector, pressure ring and pressure screws not included, safety trigger with lock to prevent unintentional opening, connections 2x M26 x 1.5 IT. Lances Direct fixation in the high-pressure cleaning lance, outside diameter 14.3 mm, spanner flat 12 mm on both sides, threaded connection on both sides 9⁄16“-18 UNF-LH ET. Shoulder support suitable for managing recoil. Lances available in other lengths. For safety reasons pipe should be no less than 48”. Side grip can be mounted in any position for better control and comfort, helps alleviate fatigue over long periods of time. Remote cable used for accessories with electrical contact like the gun offered here. Can also be used with foot valve above. The advantages of this line of flex lances are many. Chemical resistance to almost all chemicals, detergents and solvents with a good range of temperature stability make this thermoplastic hose unique. Its weight is about 50% lighter that comparable rubber hose. It is resistant to ozone and ultraviolet light. The material has high collapse resistance due to wire reinforcement which allows for use in deepwater projects. Friction loss is reduced due to a smooth inner core. The outer core reduced wear by up to 40% as well as being resistant against hydrolysis and microbes for use in seawater environments. Flex lances are kink resistant while giving greater flexibility. Used for applications in Waterblasting like heat exchanger tube cleaning. Also can be utilized in Hydraulics for pressure testing valves, tooling and control panels, and instrumentation packages for gauges. This system is a line stripe removal tool with vacuum recovery that utilizes pressure up to 60,000 PSI and flow rates up to 7.0 GPM. It has hydraulic motor and a gear drive that does not need for belts to slip or break. For proper protection use water blaster safety equipment; protective suite, safety goggles, safety boots, hand protection, gloves and more. This is a must when dealing with ultra high pressure (UHP) equipment. Turtleskin protective equipment provides protection from users especially when water jetting or waterblasting. The turtleskin water armor can protect you up to 40,000 PSI / 2800 Bar.